This is a family owned and operated business. We really take pride in the work we do. 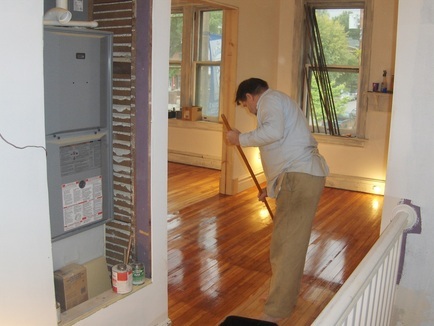 We don't try and dabble in every floor covering, we specialize in hardwood floors and are the best at what we do. One-stop shops are nice for groceries and tools, but not for tradesmen. We work primarily in St. Louis City, U-City, Ladue, Kirkwood, Webster Groves Brentwood, Maplewood and Shrewsbury as they are close to us and tend to have the historic homes we specialize in working on. Though we do also frequently work in North County, South County St. Charles and Wildwood as well. Don't buy the A-team salesman and get the B-team crew. You will talk with either Jackson or Jamy, the brothers that own this company, furthermore, you will benefit from our years of experience when it comes time for the work to be done. This is our dad, he's been doing floors since 1980 and still helps us on occasion.